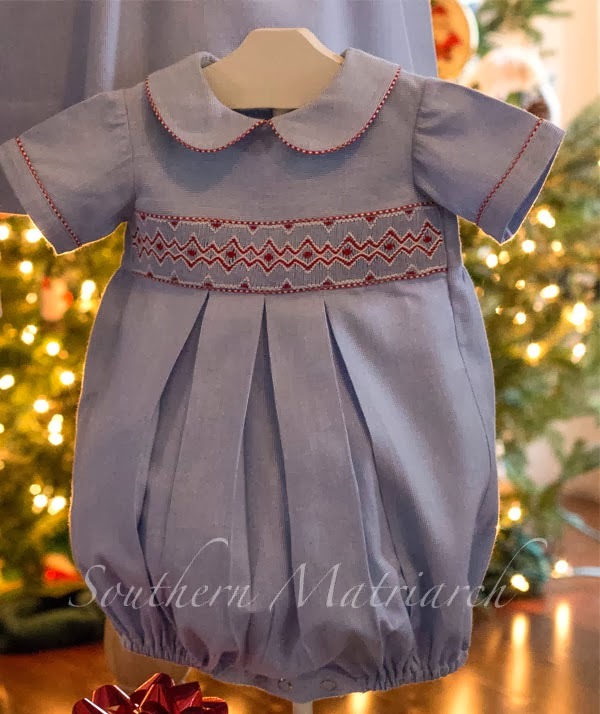 Let me tell you, smocking for three grands for Christmas is killer! It takes considering several different factors; smocking plate, styles, construction timeline as well as coordinating vs. matching. Their ages range from 6 months to three and half. Since it was first Christmas for Peanut, smocking it was. The fabric used for all was a brushed cotton houndstooth check from Farmhouse Fabrics. Piping was a cotton gingham from my stash. I wanted coordinating instead of matchy-matchy. I chose blue, candy cane red and white for longevity of wear past the holidays. The smocking is various adaptations of the plate "Little Boy Blue" from Australian Smocking & Embroidery Issue #72. The #1 key to getting these finished in time for me was pre-constructing each garment before the first smocking stitch was taken. Peanut's bubble was Chery Williams "Baby Bubbles" I used this pattern a couple of years ago for Wildman's first Christmas as well. It was also the bubble featured in the Sew Beautiful article in Issue #150 "Merry Accident" No accidents this time. Thank goodness. No time for that! This view features the closest adaptation of the smocking plate featured in AS&E. I made a narrow insert again because I don't like huge deep inserts on little ones. I made a size 6 months and it fit our chubby 19# babe to perfection. I don't have a photo of the back but it features red buttons as well. I love red buttons. Wildman's longall is Children's Corner William and Winnie. Again. It seems to fit him best. This is a size 3 and it fit perfectly on our tall, thin little man. 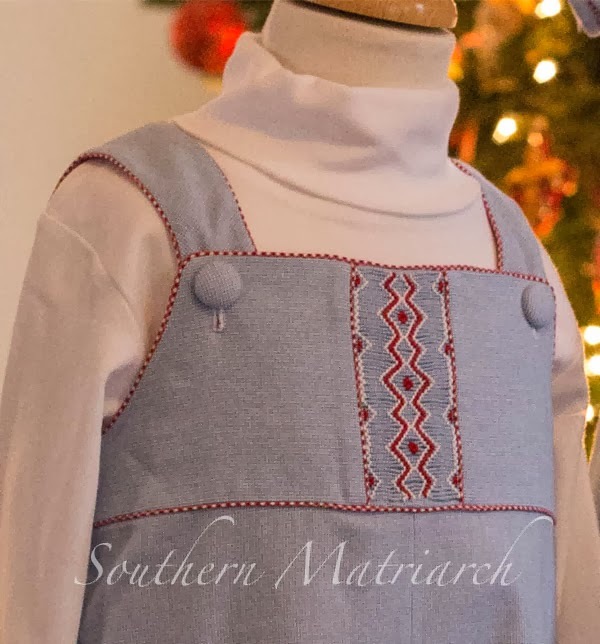 I adapted the front to include a yoke with a vertical strip of smocking in the center. An idea I admit I got from an email from Children's Corner advertising their January school. I didn't use red buttons on the front of his because I felt like that would be kind of clownish looking. I like the covered buttons better. It lets the smocking and piping stand out on their own. It is lined with the same red gingham as the piping. It is paired with a purchased turtleneck from Le Top. A friend turned me onto this brand of turtlenecks and I really like them. They wash great, shrink minimally and the collar and cuffs hold their shape and the knit fabric is yummy. I highly recommend. Princess had a Children's Corner Carol. I had never made a Carol before and I will admit to it being a bit more challenging than I expected. I like the way it turned out though. Again an adaptation of the smocking to fit the space. It also has red buttons down the back. It looked great with her red and white striped tights and red English Sandals. She is 3 and half and I made a size 4 with some length added. Speaking of shoes, I can't praise J-Ray Shoes in Mobile enough. They have outstanding in service. They know their products and shipping is fast. I can't count the number of shoes I have bought there. If by chance there is a problem returns are super easy. They will send the replacement out before they receive the original pair back. If you are looking for traditional and/or dressy shoes, you can't go wrong with them. It was well worth it for this photo. Princess and Wildman look pretty happy here, but it was dicey for a moment or two. They were only staying if Mom and Dad did. This little guy was a happy camper! Next year may not be the same. We will keep our fingers crossed. I hope your new year is proving productive. We are in the midst of a heat wave, it got all the way up to 26 degrees. And our heat went out. Did you know you can heat a bathroom with a hairdryer? Thank goodness it is fixed now and the heat is working. It is a balmy 74 degrees in the house now. A long way from the 54 it was when we got up this morning. They are so adorable and so well thought out for a mix of boys and girls items. Your creativity always amazes me. Love your posts. 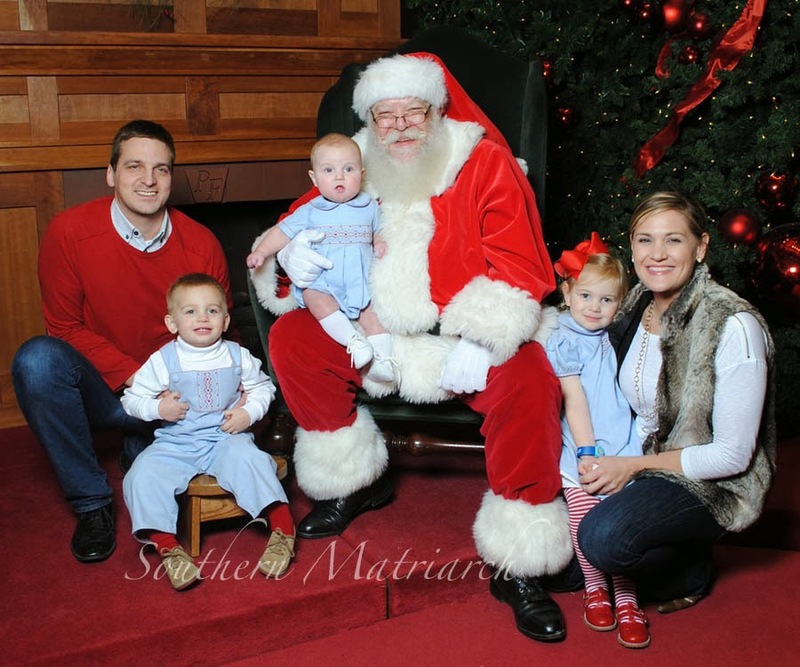 How lucky these children are to have you. These garments are so attractive and still really practical. Love in action. Martha, the outfits are gorgeous and you got a REALLY good photo of everyone. 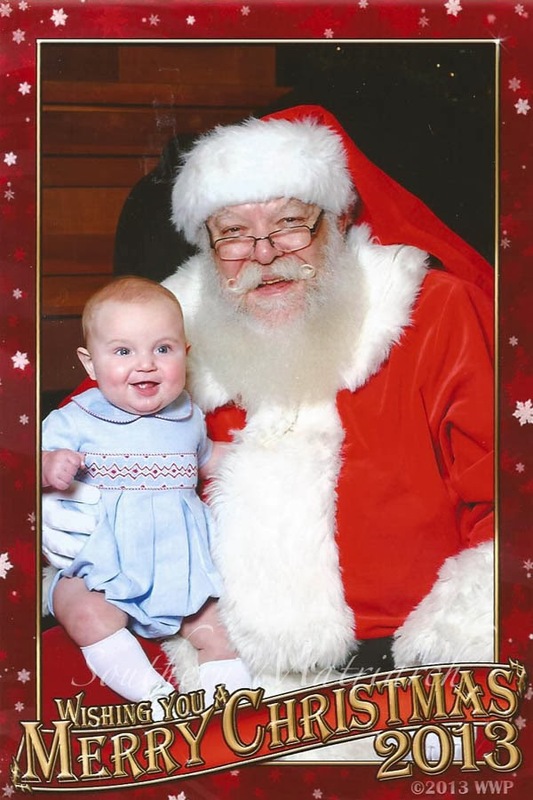 Plus great Santa and baby pic. I love the coordinating, but different outfits. So have you started on Easter? Valentines? Mardi Gras? Adorable! Great outfits, wonderful pictures. Thank you for sharing! 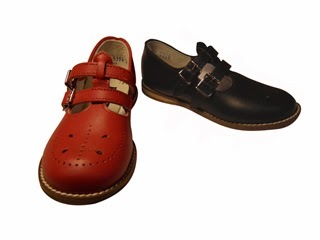 I too love J-Ray shoes... the boys had saddle shoes and the girls the traditional English Sandals. The outfits are so cute! It's been a long time since I have done any smocking (waiting for grandchildren! ), but next time I do, I will try constructing the garment first. 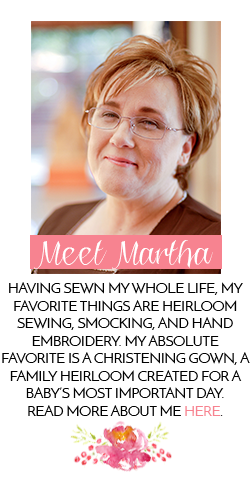 Martha, they are all simply beautiful! And kudos to you for tackling the project for Christmas. The garments are just perfect! They look great together, not too matchy matchy but coordinated beautifully. I really like your narrow smocked inserts, and the covered buttons look so professional on the longall. 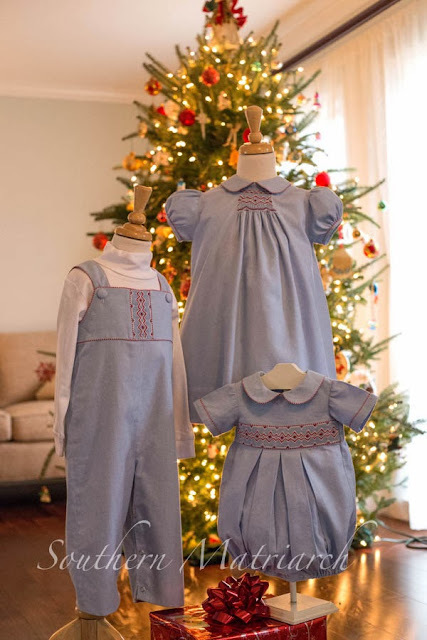 Thought of you getting all that Christmas sewing done. Did you manage all those pyjamas too. I so admire your work and am learning a lot of things from you especially regarding bishops, thank you for that! 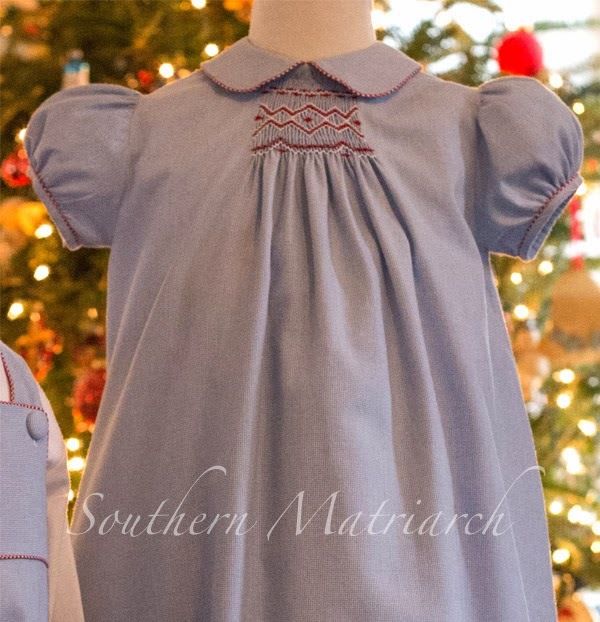 Love the color scheme and the smocking. Congratulations, what an achievement!